The Banner County defeated Brian Cody’s men at Cusack Park. Clare's Ian Galvin tackled by Paddy Deegan and Paul Murphy of Kilkenny. CLARE MAINTAINED THEIR indian sign over Kilkenny with a fourth National League victory in as many seasons at Cusack Park in Ennis this afternoon. Having averaged eight point margins in their last three encounters, this time only the minimum separated the sides after a last gasp Kevin Kelly goal from a 20 metre free lessened the final damage. Clare’s goals were much more timely however as John Conlon’s 14th minute ground strike put the hosts into ascendancy for the first time, a position they would hold for the remainder. Podge Collins added a second in the 48th minute after a flowing back-to-front move that involved Donal Tuohy, Conor Cleary, Rory Hayes and the impressive Colm Galvin for the former dual star to fire past goalkeeper Eoin Murphy at 2-13 to 0-14. That goal ensured that Clare would build up a six point cushion by the turn of the final quarter, with only Kevin Kelly’s frees preventing a handsome home win. The first half was a physical low-scoring battle that never got out of second gear until Conlon’s goal that sparked a 1-4 unanswered rally to push the Banner 1-6 to 0-5 clear by the 19th minute. Points from Kelly, Conor Delaney, Billy Ryan and James Maher (2) did lower the arrears to one by half-time but Clare stepped on the gas once more when play resumed to grab the first three points through Peter Duggan (2) and Colm Galvin. However, despite goal chances at either end, the hosts would match their opponents backlash until Kelly fired a 75th minute free to the net that ultimately came too late to deny a relieved Clare their first points. Email “Clare overcome Kilkenny by one point margin despite late rally from Cody's Cats”. 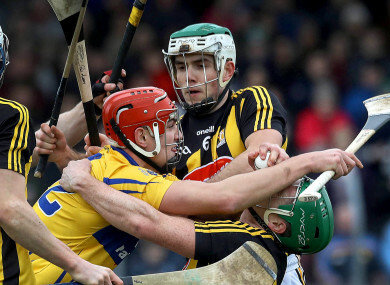 Feedback on “Clare overcome Kilkenny by one point margin despite late rally from Cody's Cats”.